Herb and Dorothy Vogel, a seemingly ordinary couple, lived for decades in a humble one-bedroom Manhattan apartment with cats, turtles, fish and ultimately more than 4,000 art-works. 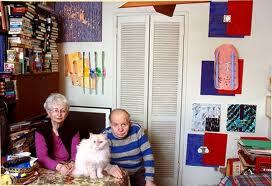 The couple used Herb’s salary to buy art, while Dorothy’s paychecks covered the bills. From the earliest days together, The Vogels realized the joys of collecting, concentrating on contemporary art. A Picasso ceramic piece was purchased for their engagement and a John Chamberlain (known for welding old automobile parts in abstract forms) sculpture to celebrate their wedding in 1962. Courted by every major museum, the couple astounded the art world by transferring their entire collection, worth several million dollars, to the National Gallery of Art in Washington D.C. – the first place they visited on their honeymoon. As government workers themselves, they liked the idea of sharing their prized pieces with the American people. After weeks of packing, shippers carted away a staggering five full-sized moving trucks of paintings, drawings and sculptures from the tiny apartment. And we fell in love with Herb and Dorothy in this video! I’ve known about the Vogel’s since I was in college. when I had my gallery sometimes my favorite collectors were the ones that put stuff on payments and so relished the pieces & would pay off one then another. Kirby I always enjoy your blogs. Can you put the word out that I’m looking for studio mate – $700 mo. including use of the press. Herb and Dorothy appear happy with life and in love. Hurray for them. If collecting art, under uncommon circumstances, contributed to this life’s condition, how fortunate they are. If fame and good fortune followed their fervent pursuit of a rare goal, congratulations. Are they not a lesson in life managment from which we all can gain? This article and video give people hope that it is possible to enjoy quality art in your own home. If you love it, there will be a way to acquire it. Even collectors need to be creative! Thank you for broadening the world of art for all of us.